Nothing has challenged the 600-year tradition of indoor opera more than performing it outdoors. 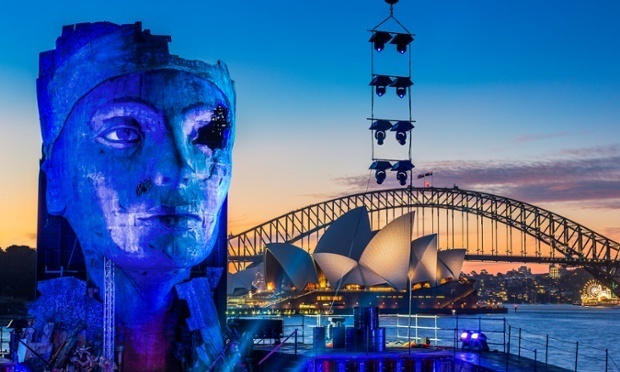 Without the imposition of a theatre, Handa Opera’s outdoor production of Aida on Sydney Harbour is one that aims to bring down the well-established walls of the opera experience. Unfortunately, it delivers delicious spectacle without an emotional build. Seated underneath the stars, with the Harbour Bridge and Opera House lights behind, stands the massive decaying head of Queen Nefertiti, the centerpiece of the performance and foreshadowing the upcoming show, glorious but corroded. But it does not cue the rest of the design. Instead the stage is host to antiquities and characters dressed variously as modern-day security guards, Grecian princesses, and swashbuckling pirates, a digression from the all-Egyptian set Aida is notable for. Helmed by director Gale Edwards, the tragedy of forbidden love between Ethiopian Aida and Egyptian Radames in wartime is visually stunning and triumphant thanks to Mark Thompson’s design. Loud sounds and bright lights elevate the opera with fireworks mid-performance and camels during the famous Triumphal March to top off the spectacle. But the flamboyance and lack of subtlety in an outdoor space makes the production unmoving. It cannot engage with an emotional audience in the way it should. Latonia Moore is incredible in the role of Aida, her soprano soaring both in infatuated love and distress, capturing an internal conflict between wanting to be with her love and defend her country as princess. Radames’ Walter Fraccaro is also very strong throughout, but overacts at times. It is Milijana Nikolic, in her role as Princess Amneris, who steals almost as many scenes as Aida herself. However, the venue makes it difficult to hear the skill of the cast’s voices, more difficult, I imagine, than in an opera theatre. The initial half of the opera is at first stunning, but ultimately tiring in its establishment of plot and characters. Thankfully, the second half is more emotionally satisfying and seems more invested in story than style. Once diverted from the physical conflict at the centre of the narrative, the domestic drama comes to the fore and we see why this opera continues to be performed. The final notes of the concluding aria are an irresistible invitation to a rightly canonical story. Despite it’s flaws, opera on Sydney Harbour is a must-see, working because it interests those who would not normally attend an opera, providing an alternative experience to that traditionally on offer at the Opera House. But this outdoor extravaganza loses quiet moments and thus the beauty of the story, making for an Aida with plenty to be dazzled by, but no heart.